The landscape of Austin is carved with picturesque surroundings, waterways, Texas hill country, abundant green cover and historical buildings. The city which saw real growth in the 1800 is now noted as one of the best cities to live and work in. 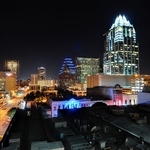 The impressive skyline of Austin is comparable to the skylines of New York, San Francisco and Sydney. The city is also home to the most spectacular hotel in United States, the Driskill Hotel that is touted as the finest hotels in United States. The city has a substantial activity in the green building arena, with numerous LEED certified building taking share in the Texas capital. At night the historical monuments of Austin are lit by "Moonlight Towers" that give an internal glow to the buildings, making them seem alive. 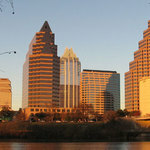 The city's parks, such as the Zilker Park offers some attractive outdoor locations that draw people in scores here every day. The park is also home to the Barton Springs Pool, a pool that attracts a diverse crowd of nature lovers. There is no scarcity of outdoor locations in the city of people who wish to spend most of their days under the sun.